Product #6316 | SKU 1197295 | 0.0 (no ratings yet) Thanks for your rating! For use with your Intuos4, Intuos5, and Cintiq tablets, the Classic Pen from Wacom is battery-free, cordless, and has a slim, classic design that does not utilise a rubberised grip. 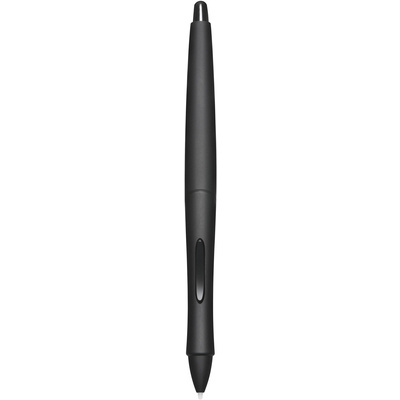 A number of different features make this pen well-suited to drawing, erasing, and mouse operations. Two customisable buttons allow you to set right-click, left-click, double-click, as well as drag-and-drop functions to your liking. In addition, the pen is both tilt and pressure sensitive, so that you can capture very light or heavy pen strokes, as if naturally writing or drawing. You have the option to adjust these sensitivities as well. At the pen's lightest pressure sensitivity, it responds to as little as one gramme of pressure and can register up to 2048 different levels of pressure. Using the pen in a supported paint or photo programme, these sensitivities come in handy for adjusting line weight, brush size, image opacity, or exposure. As a nice, added touch, an eraser crowns the top of the pen, so that you can digitally erase your work as you go along. In terms of accessories, included are two standard nibs, one stroke nib, one felt nib, and one flex nib. Also included is a pen stand that can hold the pen, some spare nibs, and the extractor (not included).